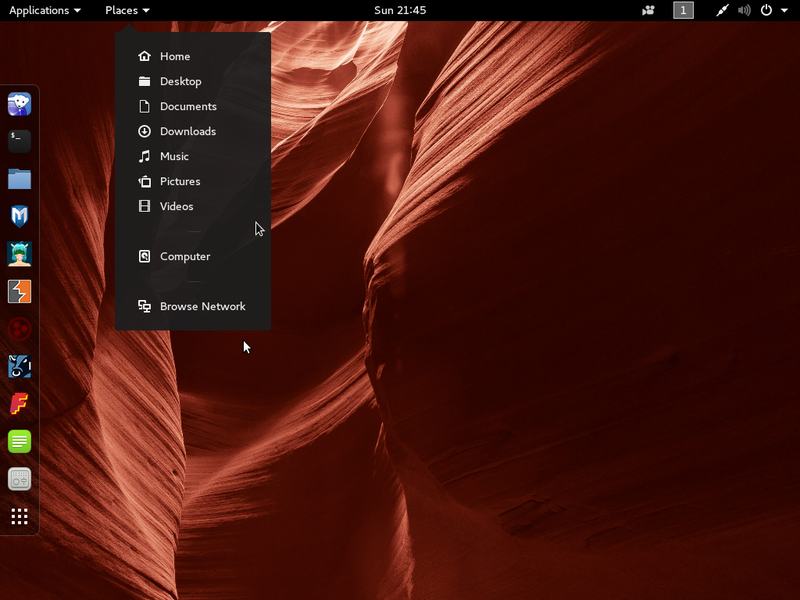 Mandriva 2011, code name Hydrogen, is the latest desktop edition of the popular Linux distribution. Released August 28, 2011, it marks a new direction in the development of Mandriva desktop distributions. Where there used to be three versions of previous editions (Mandriva One, Mandriva Free, and Mandriva Powerpack), the Release Notes say that only two versions (One and Free) are available for download. That is what is in the Release Notes. In reality, however, there is only one version of Mandriva 2011 and it is available as an installable Live DVD edition for 32- and 64-bit platforms, each weighing in at about 1.6GB and 1.7GB respectively. This article offers a detailed review, based on test installations (in a virtual environment and two real computers) of the 32-bit version. 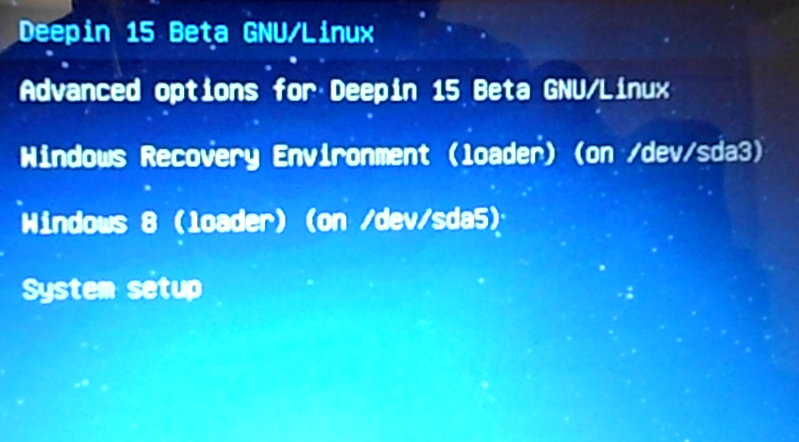 Shown below is the boot menu, which gives you just two options. I think a third option, “Boot from local drive,” should have been added. Installation Program and Installation Process: A statement in the official Tour Guide says that the installation program (of Mandriva Desktop 2011) is new. That, is not exactly true. It is still the same Mandriva installer. A few steps have been removed, a few rearranged, but the core of the installer, as far as I can see, has not changed. If you have ever installed previous releases of Mandriva, the image below should be very familiar. It is the step in the installation process that shows the available partitioning methods. Depending on the state of the target hard drive, one or two of the options shown will not be listed. Aside from the “Custom disk partitioning” option, selecting any other option will result in an automated partitioning of the target disk, without further input from you until the boot loader configuration step. 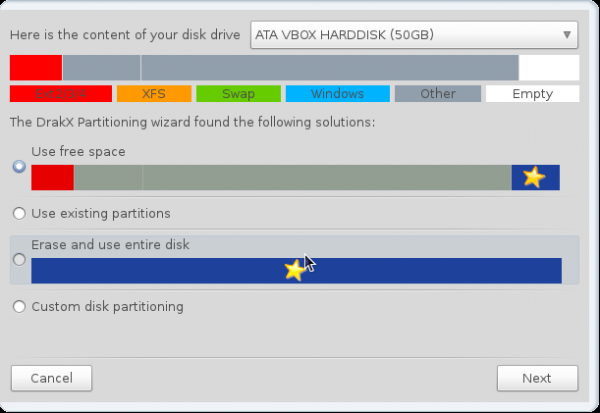 Selecting the “Custom disk partitioning” option opens the manual disk partitioning tool. Unlike the “advanced” partitioning tool of Ubuntu, this is truly advanced. 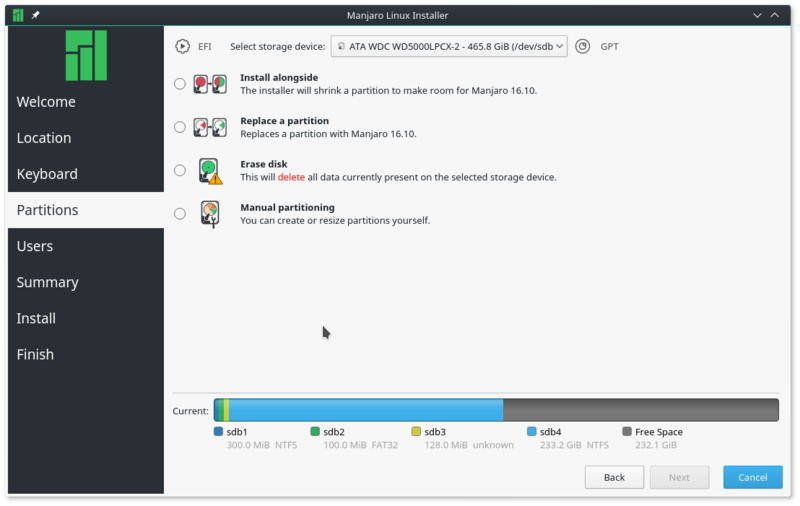 This screenshot shows the default partitions created by the installer when an automated partitioning mode is selected. 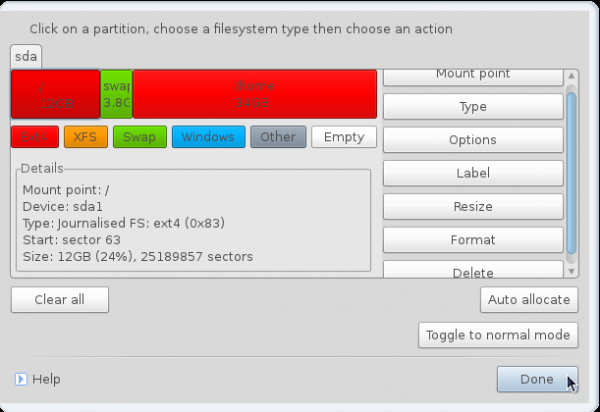 By clicking on the Auto Allocate button, the installer gives you the option to create partitioning schemes other than the one shown in the image below. The default file system is ext4, with other journaling file systems also supported. If you attempt to create partitions when in the expert mode, the installer gives you access to more file systems than you have ever used. See Mandriva 2011 installation and disk partitioning guide for a manual partitioning guide. Though LVM, the Linux Logical Volume Manager, is supported, it is not the default. Disk encryption is also supported, but I found that the installer will not allow the encryption of the root partition. When a partition is assigned the / (root) mount point, the “Encrypt partition” checkbox is deactivated. The same holds true for a partition assigned the /var and /usr mount points. This comes as a surprise to me because just about two months ago, I published an article on how to install Mageia 1 on an encrypted LVM file system and another on how to install Mageia 1 on a btrfs file system. I could not do the same for Mandriva 2011, even though Mageia is a recent fork of Mandriva, and the installers are the same. Something is broken! If you are reading this and have succeeded in installing Mandriva 2011 on an encrypted disk, let me know how you did it. The installer will, however, allow the encryption of the /home partition and other partitions other than those mentioned above. The minimum hardware specs for installation is 640MB of memory and 10 GB of disk space. In spite of that, I was able to install it on a computer with 435MB of effective memory. A new installation takes up almost 5.9GB of disk space. 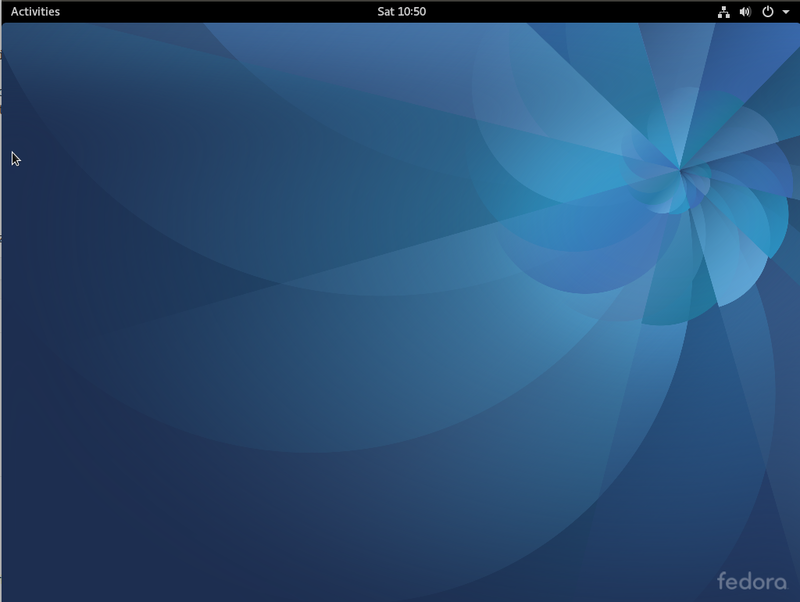 Desktop: Mandriva 2011 is the first (Mandriva) edition to be solely a KDE-based distribution. Other desktop environments will no longer be officially supported. Packages of those desktop environments are, however, still in the (official) repositories. While the latest stable version of KDE is KDE 4.6.7, Mandriva 2011 ships with KDE 4.6.5. Below is a screenshot of the default desktop. Nice wallpaper, by the way. 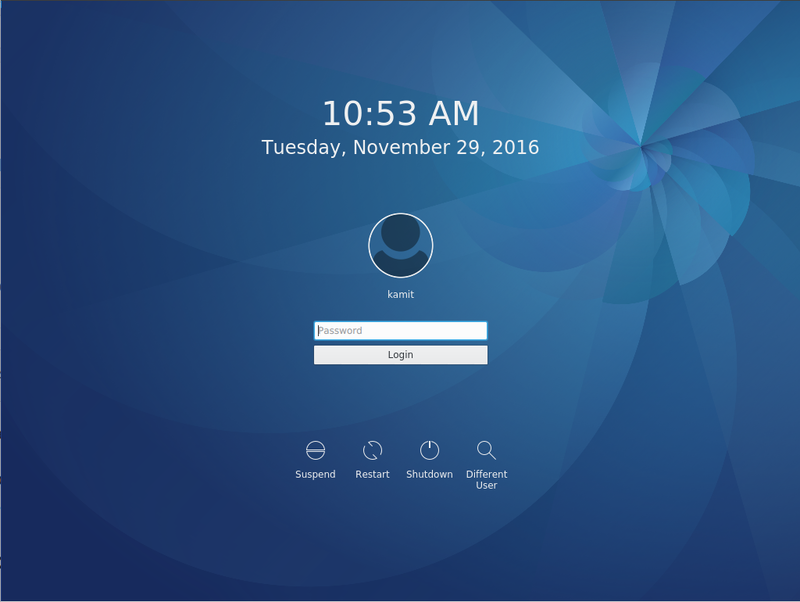 While it looks like the standard KDE desktop, there are a few new features. 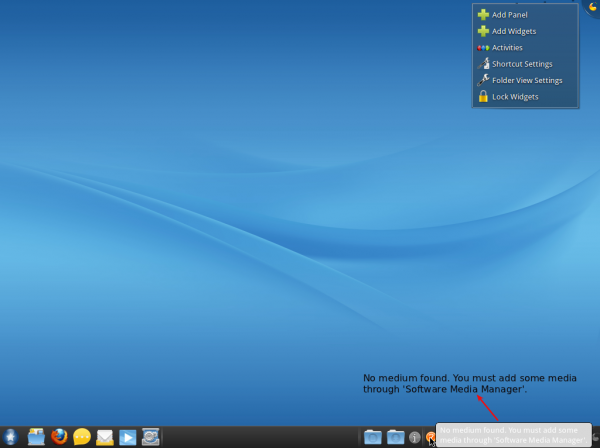 For starters, the panel is not the traditional KDE panel, but a new panel called the Rocketbar, which is made up of three parts – the right side, with the application icons, the middle section, which serves as a dock for running applications not started from the right side, and the left side, where the notification area and system tray are. Mousing over the items on the Rocketbar, I observed that text within the tooltips are about the same color as the background, which makes it virtually impossible to read. You can, if you bury your face in the monitor. In the screenshot below (you may click to enlarge it), for example, it is almost impossible to read the text in the tooltip, which has been typed on the desktop itself, just so you could read what it says. And this is not just isolated to items on the Rocketbar. 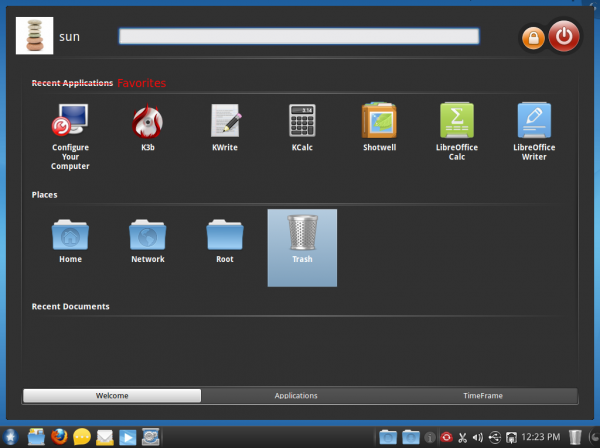 You can see the same issue, while using the graphical package manager, the user manager and other graphical administrative applications. The problem with that is, as you use the system, those pre-populated (application) icons are replaced by the most recently used ones, from left to right, in the order they were last used, not in alphabetical order. SimpleWelcome maintains its form at screen resolutions of 1024×768 and higher. At 800×600 and lower, it begins to fall apart. This screenshot, for example, was taken from a system at a screen resolution of 800×600. You can see what has happened to SimpleWelcome. At higher screen resolutions, seven icons are visible horizontally. You can clearly see how many are visible at this resolution. This is a major drawback of SimpleWelcome, but if you will never use your system at 800×600, then you have nothing to worry about. By the way, if you do not like SimpleWelcome, if it is too loud for you, you can always replace it with the Kickoff menu, the Classic menu, or the Lancelot menu. How to customize Mandriva 2011 gives a step-by-step guide on how it is done. Superb review. Clear to the point. I have to add (look at n. 1 post) that I installed Mandriva 2011, because I encountered some problems with Mageia (random freezes on boot). 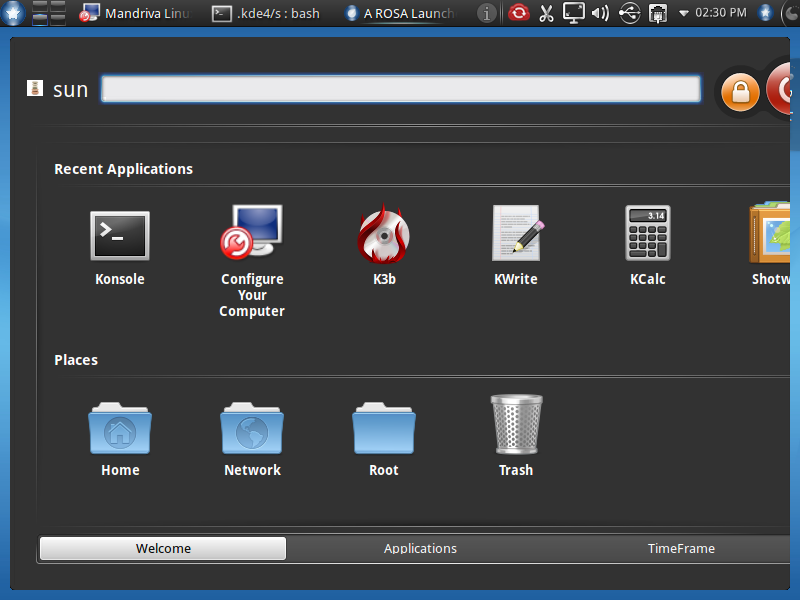 Mandriva is running very good. No problems so far. The desktop is BEAUTIFUL, very polished and elegant! I got rid of Rosa panel, installed a standard panel and now I have an absolutely typical KDE desktop (with very nice wallpaper and widgets). I added the new Restricted repository and installed all the required codecs and multimedia stuff in a moment! Clementine and VLC work very well: I can play everything from mp3 to DVD (after installing libdvdcss2 from the Restricted repository). Installing the proprietary Nvidia driver was a breeze! The control center is awesome! My sincere advice is to try it! I’ve tried Mandriva on live cd, but then I prefered to install Mageia on hard disk, because I liked a more traditional KDE desktop. In my case, Mageia has a better hardware recognition and, in my opinion, is more polished and accurate. I believe that Mageia 2 will rock. You can do that, just have to be quick about it so the authorization wont time out before adding the next app. That proves my point. You cannot queue multiple applications for installation in Ubuntu’s Software Center and Linux Mint’s Software Manager. I never tried mandriva before but looking at the screenshot I think I should try mandriva now after seeing ubuntu changed to unity. 1. RPM originally stood for Redhat Package Manager. 2. The command line rocks! 3. I don’t consciously use encryption, so I don’t know (plus, I’m using Mageia 1 instead of Mandriva 2011; I might upgrade to Mandriva 2012, but the Mageia 1 packages are newer than Mandriva 2011’s, so I don’t think downgrading is a good idea). A interesting review. But I must say I prefeer Mageia now instead of Mandriva. 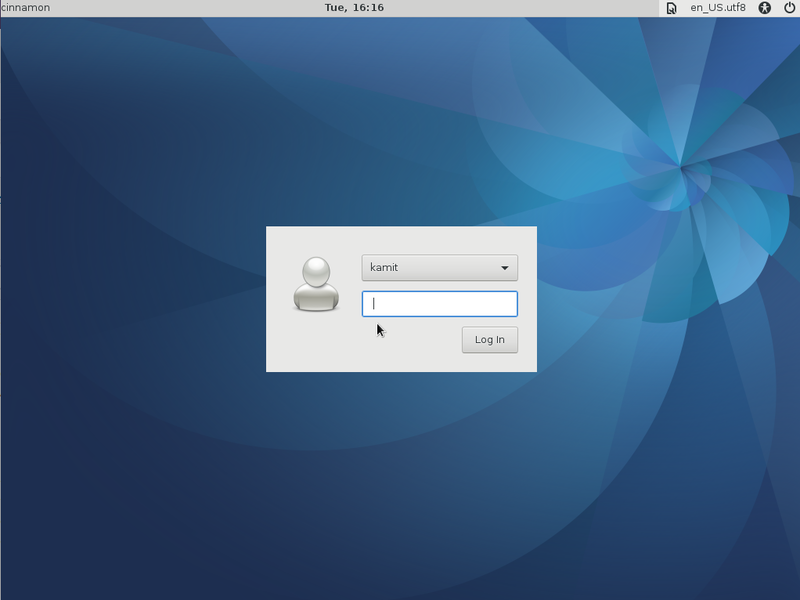 Rosa panel, Unity and Gnome 3 are nothing for me yet. I am the “old school” in computer look. But who knows, maybe I will try with it someday again. Awesome review. I find the issues you raised about security very interesting. I don’t thing any reasonable person will cripple disk encryption, remove the security features of the boot loader, and disable the firewall. What’s the point? I think I smell sabotage. Considering that Mandriva has been bleeding employees, I think a disgruntled developer, must have done something nasty. This is a guess, but what other explanation could there be? I agree. With Mageia’s rise in popularity, I dont see Mandriva lasting much longer. This reminds me a little of Fedora’s split from Red Hat in 03. Hm, I thought Red Hat was renamed to Fedora. 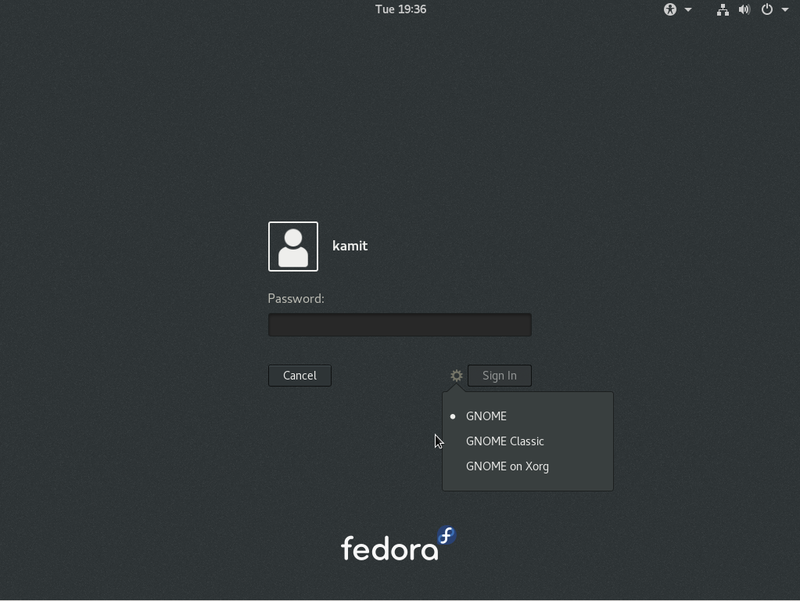 No, Red Hat Linux was renamed to Red Hat Enterprise Linux, while the “free” desktop version is simply called Fedora.